Green Qi supplies your body with a multitude of fruit and vegetable ingredients to help maintain energy, healthy body cells, boost antioxidants and support healthy digestion. 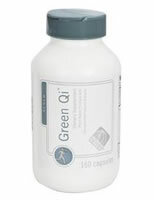 The ingredient combination in Green Qi is rich in vitamins, minerals, amino acids and essential enzymes. The ingredients in Green Qi feature 100% organic status and, following a freeze-drying manufacturing process are powdered and then combined to provide the highest possible level of nutrients. Nothing is removed apart from water – all the other key elements remain in place – awaiting rehydration! A potent nutritional combination to help you feel healthier, more energised, and balanced. Activated Pre Sprouted Barley (PSB): The optimal nutritional state of the plant. Spirulina: One of the greatest sources of vegetable protein and antioxidants. Linseed (Flaxseed): The richest vegan source of Omega-3 fatty acids. Barley Grass: The ideal enzyme/PH balancer to assist bioavailability. Quinoa (pronounced Keen-wah): A mineral-rich fibre provider. Apple, Bilberry, Raspberry Leaf, Carrot and Lemon Peel: Pigment providers and natural flavour enhancers. All ingredients are 100% certifed organic. Mix ¼ scoop (4g) Neways Green Qi in 200ml of water or juice, one to three times a day before a meal. Activated pre sprouted barley powder (organic), Flaxseed powder (organic), Spirulina powder (organic), Apple powder (organic), Quinoa powder (organic), Barley grass powder (organic), Bilberry fruit powder (organic), Lemon peel powder (organic), Raspberry leaf powder (organic), Carrot powder (organic).